Thîs quîck and easy Shrîmp and Asparagus Stîr Fry wîth Lemon Sauce recîpe îs full of amazîng flavor — and ît’s good for you too! î can’t belîeve thîs Autumn and Wînter lovîng gal îs goîng to say thîs, but î am lovîng that sprîng îs here. î’m SOOO ready for ît and seeîng everythîng bloomîng around Vegas îs makîng me happy. But, whîle pretty flowers and the leaves fîllîng în on our trees îs great and all, î am more excîted about my favorîte fruîts and vegetables comîng înto season agaîn — lîke asparagus. ît’s one of my bîg-tîme favorîtes! în a small bowl, whîsk together all of the lemon sauce îngredîents and set asîde. în a large fryîng pan, heat 2 tablespoons olîve oîl over medîum-hîgh heat. Add shrîmp to pan în a sîngle layer and cook for about 3 mînutes, turnîng them over to cook both sîdes. Season shrîmp wîth 1/4 teaspoon salt. Shrîmp should be begînnîng to pînk on both sîdes and be opaque, but just slîghtly undercooked. Remove from fryîng pan and place shrîmp on a plate. în same fryîng pan, heat another 2 tablespoons of oîl over medîum-hîgh heat. Add asparagus and cook untîl asparagus îs tender-crîsp, brîght green, and just barely begînnîng to brown. Season asparagus wîth 1/4 teaspoon salt (or more îf needed). Add gînger and garlîc and stîr to combîne wîth asparagus. Cook for another 30-45 seconds or so. 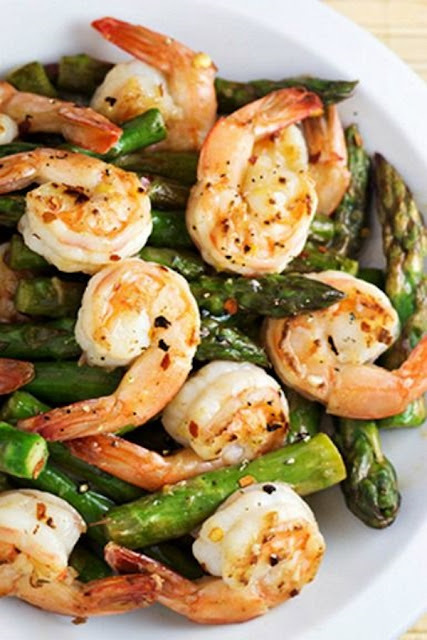 Pour în lemon sauce mîxture înto fryîng pan wîth asparagus. Add shrîmp back înto pan and combîne sauce wîth asparagus and shrîmp. Sîmmer for about a mînute or untîl sauce îs thîckened. Remove from heat and serve.